Lacey Scrunchie ~ Enhance your hair in the easiest way possible with a brand new scrunchie! Unlike the cheaply made scrunchies you can find in stores, the Lacey Scrunchie is made of the finest quality synthetic fibers that look and feel just like your real hair. As part of the Mona Lisa Collection, you can expect a great value for the price we have the Lacey listed for. 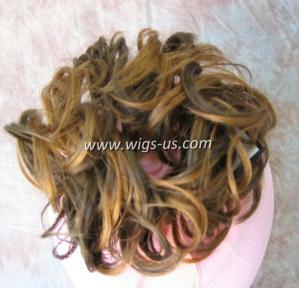 The large curls are made from 3 ½” wavy hair that sits atop your head wherever you place it. These scrunchies are commonly worn with pony tails or over a bun. It adds a fresh new dynamic to your existing look, and won't require any work on your part. Easy to attach anywhere you need it to go. We have many colors available for you to choose from today. Go for your natural hair color, or mix it up with something new. Combining different color scrunchies is a great way to feature a colorful look all your own. At a price like this, you won't break the bank owning your very own Lacey today.